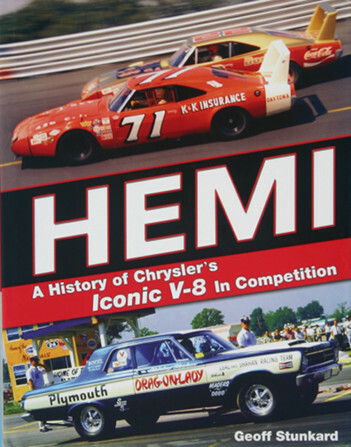 Since 1953 the most iconic and feared racing engine in the United States has been Chrysler Corporation's Hemi V-8. This book covers all aspects of this engine's developmen,t from the first attempts to make the concept work to the ultimate 426 Big Block racing engines. This book, obviously a labor of love, provides a complete history of Chrysler's most famous engine family from the very beginning of it's development through 1979. The epilogue briefly covers the rebirth of the latest generation of Hemi engines. The research is flawless, with much previously hidden history recounted, including tales from Chrysler's unofficial in-house racing team, which did all the development and testing both on and off the clock, to the many outside firms that helped work around the Auto Manufacturer's Association racing ban. If it raced with a Hemi, from Dirt Track to Top Fuel, it is covered in detail in this tome. The sheer amount of previously unknown material about this engine quite boggles the mind. It includes details, such as buying parts under the table from competitors to save time and money in development, to the spectacular failures both on the track and in the lab. I could go on about all the weird bits of history, but better you should obtain a copy and enjoy the history. For all dyed in the wool MOPAR fans, this is the ultimate resource. For the others, this book will prove enlightening as to how Chrysler was able to dominate all forms of racing. I would like to thank Car Tech for providing the review copy.